When I am in front of the computer, I have my bookmarks set to my apps to organize my to-do list, check up on my clients, collaborate with my team members, set travel plans, and compose my next article. The idea that there are online apps for just about anything has never been truer. That is why I was not surprised to find web apps that touch on interesting subjects like motivation, life reflection, and planning for life’s goals. Here are five fun, useful, and highly personal web apps that can help organize your life the cool way. Lifemetric is described as a “social experiment that aims to track the factors of our lives that shape our society.” This app helps you track the different aspects of your life as you rate them one by one including your mood, sleep, love life, work productivity, etc. Lifemetric will then analyze the relationship between these aspects and generate a graph for you. This app can tell you some interesting and insightful stuff like how much you get agitated with less sleep, how productive you are when you feel good about your love life, how much coffee affects your mood, and many more. You can compare your graph with other members or you can view the results of the entire Lifemetric community. This app will help you learn a lot about yourself and find a balance in your life. 43things is a web community based on setting and accomplishing goals. You can find like-minded people with different goals and read about their experiences. Your goals can be as simple as ‘finish one book a month’ to big-time stuff like ‘own and raise a dog’ or ‘finish my online graduate course’. Once you list your goals, chances are there are people who are trying to complete the same goals and you can help each other achieve them. With collective support like 43things, big goals become more manageable. 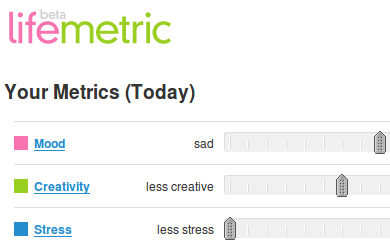 HighxLow tracks your daily mood by using your Twitter account. All you need to do is tweet to @highiam if you feel happy, and @lowiam if you are in a bad mood. Highxlow will then track your mood and generate a “mood graph” for you. After a few days of tweeting to HighxLow, you can view the graph and analyze why you may feel happy in some days, and sad in other days. You can also tweet to @cheeron to encourage your twitter friends when they are having a rough patch. HighxLow is a neat app to find smudges of positive thoughts to help you get through the day. Wesabe is not your old regular personal finances tracker. Its real strength is the growing community of supportive people that share advice and ideas to help you get more value with your money. While it has the usual features like allowing you your accounts in one place, organize your transactions, and set spending targets, you can also learn a lot such as how to set financial goals, save on specific purchases, live frugally, and motivate yourself to accomplish your life goals. Joe’s Logbook is a tracking tool and journal of personal goals and dreams. Like any logbook, you can set notes everyday for each goal that you want to achieve and track your progress. Reward yourself with a checkmarks for small victories, or give yourself a red X if you encounter a setback. The single-page interface allows you to track any area of your life like spending, diet plan, health, and other life goals with a simple scoring system. Joe’s Logbook interface makes it one of the niftiest personal goal applications in the web. At the end of the day these are just tools to organize your life/lifestyle. They inspire, motivate, and give you a system to track your life and accomplish your goals. I recommend to try them out extensively and develop a habit to use them if you want these tools to work for you. If you have your own set of “life tools” please hit me with your comments and share them with the MUO community. Cheers! Great Grocery Map-list Tool to aid in grocery shopping. The app save time and money! interesting... i guess i need to give it a try. I used Wesabe for awhile but it doesn't play well with non-US banks. (I'm Canadian). I switched to Rudder. Still, there are problems, but overall I like the format better and the fact that Rudder sends me an e-mail everyday with what's going on with my accounts.